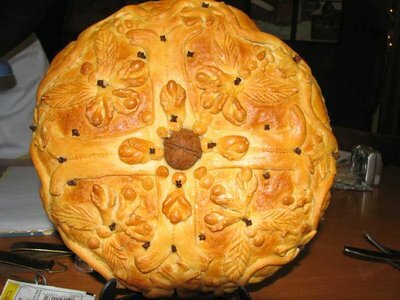 In Corfu the Venetian influence is echoed in the island’s Easter bread, which is called fogatsa. Unlike the braided tsoureki eaten everywhere else in Greece, here the Eastern spices mahlepi and mastic are nowhere to be found. Instead, fogatsa is a dense, high, round loaf, with a cross slashed into its center and flavored with bergamot spoon sweet. 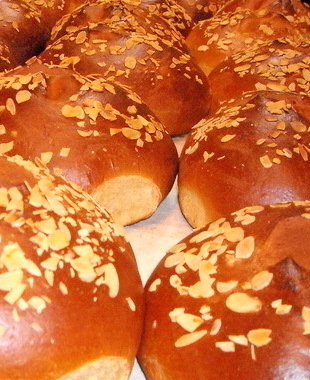 Whereas tsoureki is sprinkled with either blanched almonds or sesame seeds, in Corfu the bread can be topped with caraway seeds. 1. Heat the milk in a small saucepan until it is just warm. Pour it into a very large glass or ceramic bowl and stir in the yeast, 1 cup of the flour, and 3?4 cup of the sugar. Place the bowl in a warm, draft-free place, lightly covered with a cloth, and allow to stand until the yeast starts to bubble up, about 30 minutes. 2. With an electric mixer in a medium bowl, beat the egg yolks with 3?4 cup of the remaining sugar until pale and creamy. Pour this mixture into the yeast mixture. Stir in the drained orange or bergamot spoon sweet, vanilla, kumquat or orange liqueur, and melted butter. Slowly add flour, 1 cup at a time, mixing it in with a wooden spoon, until a mass begins to form. Turn this out onto a lightly floured work surface and knead, adding more flour if necessary to form a very smooth, large ball of dough. Cover, place in a warm, draft-free place, and allow to stand until the dough has doubled in bulk, about 2 hours. 3. Punch the dough down and knead again for about 7 or 8 minutes. 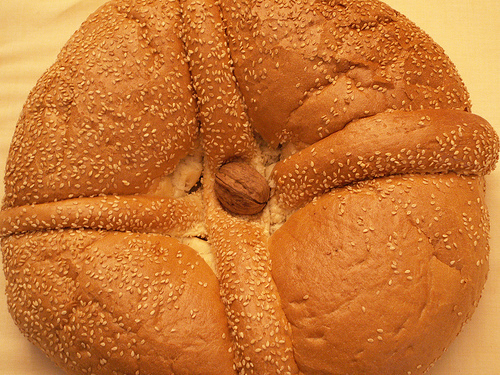 Shape into 2 equal round loaves and place each on a buttered baking sheet. Make 2 sharp slashes like an X on the surface of the dough, cover with a cloth, and let rise again until doubled for about 1 hour. 4. Preheat the oven to 350°F. With an electric mixer, beat the egg whites with the remaining 2 tablespoons sugar in a medium bowl until they are frothy without forming peaks. Brush the surface of each loaf with the mixture, sprinkle with caraway seeds, and bake until the fogatsa has swelled and browned, about 1 hour. Remove from the oven, let cool on a wire rack, and serve.